Barcelona midfielder Xavi was the most unselfish player this season on any squad in the La Liga and is awarded the LLTO award for Best Team Player. And why not be unselfish with the ball when you have the talent that Barcelona does? Certainly having the ultimate dream team of Eto’o, Messi, and Henry to dish the ball to doesn’t hurt your assist numbers from piling up, but let’s not take away from Xavi’s obvious contributions to the squad. He not only led the league in assists he led in dominating fashion, racking up 20 regular season assists along with 6 goals. But what Xavi really brings to the table is a consistent performance. In the highest stakes matches like the UEFA Champions League, the key Spanish player was excellent. He scored 2 goals and dished for 7 assists in the 11 matches. And I am sure leading Champions League goal scorer Lionel Messi didn’t mind his teammate’s contribution. Xavi’s Champions League performance was worthy of being named to the UEFA Team of the Year for his second consecutive year. And why not? Xavi was named by UEFA the Man of the Match for the final against Man U due to his excellent passing and control of the game. And perhaps this is the true key to Barcelona’s success. Already having goal scoring threats like Lionel Messi, Thierry Henry, and now recently added Zlatan Ibrahimovic is just not fair for clubs to play against. 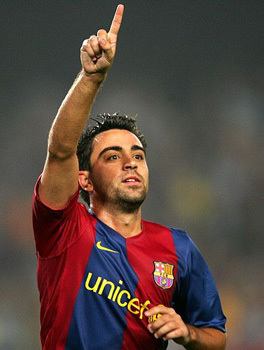 Then when you combine this talent with the experience and precision that Xavi brings to the center of the pitch…. It almost isn’t fair for the rest of club’s in the world.